We’ve pondered before whether Anacostia, a neighborhood in Ward 8, is actually being gentrified. 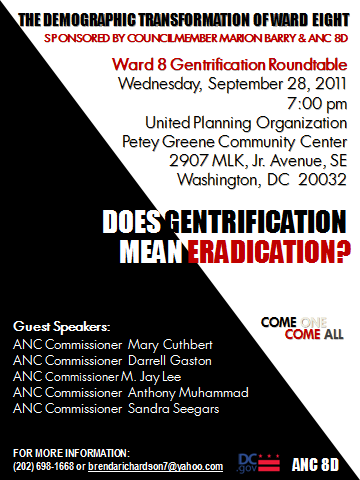 But residents will get their chance to chime in on the topic during tonight’s roundtable focusing on the “demographic transformation” of Ward 8. The event, which starts at 7 p.m., is sponsored by Ward 8 Councilman Marion Barry and the Advisory Neighborhood Commission 8D. I’ll be there, so follow me on Twitter for occasional updates. In Your Words: Who Are The Native Washingtonians?